Use Our Online Pricing Software. 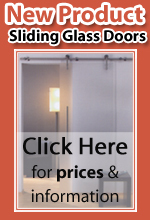 Enter your door width, height and extras and get your Glass Door Price. All of our glass doors are bespoke - made to your exact sizes, if you do not understand this please email us. 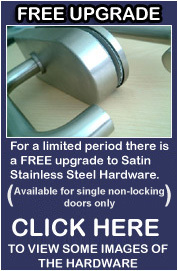 FREE UPGRADE TO SATIN STAINLESS STEEL GLASS DOOR HARDWARE - This is offer is available for a limited period only and while stocks last. Once they are gone they are gone!!. Only available for non locking. Only available for SINGLE glass doors. NOT available for DOUBLE glass doors. NOT available with thumbturn mechanism. We pay the VAT! Click here to see information on our VAT offer.